Of those polled, 42% feel that their college degree wasn’t worth the student debt it created. However, 88% said that they did not regret their ultimate decision to go to college. When asked about specific regrets, the most common response was that people wished they had studied harder, with about one in five respondents feeling this way. Getting a college education is increasingly viewed as a necessity for chasing down the American dream, but is college worth it when you factor in the mountain of student debt that often comes with it? As more and more Americans begin to come to grips with what it really means to borrow tens of thousands of dollars before you’ve even started your career, the question of just how important a degree really is has started to become more pressing. 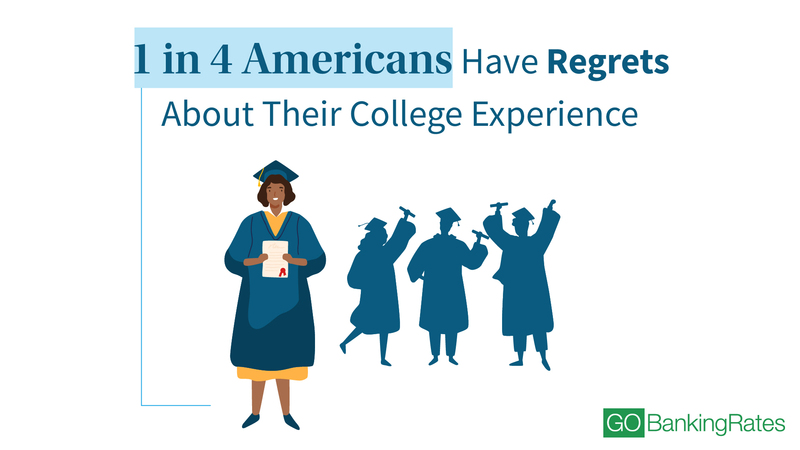 That’s why GOBankingRates conducted a survey on whether or not Americans have regrets about going to college. Some 500 Americans with college degrees were polled about how they feel about their decision now, whether or not paying for college was worth the money and what they might do differently if they had a chance to do it all again. Keep reading to learn more about how they answered and what they do and don’t regret about their college decisions. On balance, a little over two in five Americans feel that their time at college just wasn’t worth the debt it created. That might not be so surprising given the size of the student loan debt crisis. The total amount of student loan debt in America clears $1.5 trillion across nearly 45 million people, and borrowers in the class of 2017 are facing an average student loan debt of $28,650. Do you believe your college degree is worth the amount of debt you accrued? These results, though, take on a different meaning in the context of some of the other responses. Over half of those polled who are currently employed felt that they wouldn’t have been able to get their current job without their degree. And, when asked to rate how valuable their degree was to their career on a scale of one to five with five translating to “very valuable,” 44% answered with a five and another 17.7% answered four. So the results appear to indicate that while those surveyed don’t regret college itself, many do regret its costs. The breakdown by age appears to also support that conclusion when you consider the trends in the cost of college. For Americans ages 55 and older — a generation where the cost of college was much, much lower — a much larger majority felt that it was worth any debts incurred during their time matriculating. But the results are all the more intriguing when placed in the context of just how much debt people said they had due to college costs. How much student loan debt did you accumulate throughout your undergraduate college career? If 46.4% of those polled didn’t have any debt, it could mean that your perspective on how “worth it” college loans are has a lot to do with whether you actually needed them or not. 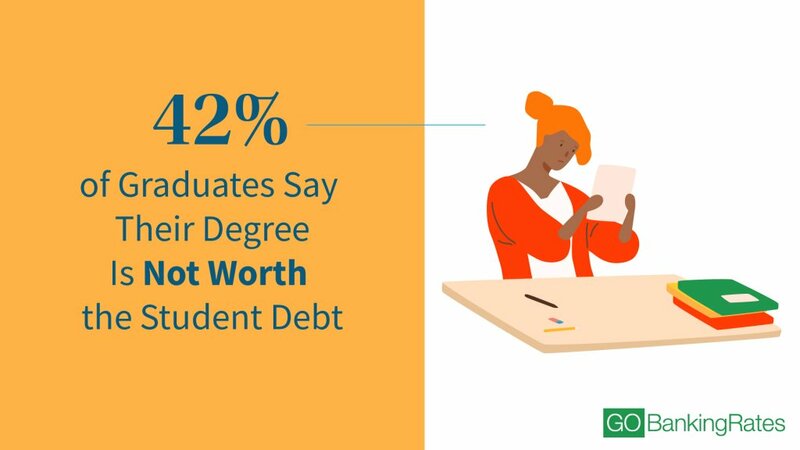 If one assumes that all 46.4% of those polled who graduated without any debt were also among the 58.4% who said college was “worth the amount of debt you accrued,” that would mean that almost 80% of those who said college was “worth the debt” didn’t have any debt to speak of. And, turning that around, it would also mean that of those people who did graduate with debt, three out of four ultimately felt that college wasn’t worth the cost. While there’s clearly a large portion of those who needed to take on debt to graduate while also feeling like it hasn’t been worth it, that appears to have more to do with the amount of debt than it does with their experience at college itself. Across the board, the Americans in this survey seem to have a starkly positive perspective about their time in college. On a scale of 1 to 5, how much do you regret your ultimate decision to go to college? A mere 6% of those polled either regret or greatly regret their decision to attend college. Meanwhile, over three out of four said that they had no regrets with another 16.8% answering that they had few regrets or were neutral on the subject. And, once again, the older you are the more likely you are to have a starkly positive view of your college education. For seniors, over 90% said that they had no regrets, with the 55 to 64 age group at almost the same level. Once again, that could be a reflection of just how dramatically the cost of college has risen, meaning younger generations are making greater sacrifices to make their college degree a reality. However, it could also reflect people at the end of their career who have a long-term perspective on what it’s meant. While a recent graduate working an entry-level job in their early 20s might not think their massive loans were worth it, they might feel differently with the added perspective of just how far they were able to go in their field over time. The fact that regrets about college debt don’t translate to regrets about college itself among those polled is born out by the responses to a question about what, if anything, respondents would do differently if they could go back in time and make different choices. Of the other choices that did get responses, 25.9% said they would have chosen a different major. That would mean almost two-thirds of the people who did select one or more of the responses felt that they wish they had chosen a different field of study. Just 3.2% of those polled answered that they wish they had decided not to attend college at all. Regardless of how they feel about the debts accrued, most people feel comfortable with their alma mater: Only 12.7% say they would have attended a different college in hindsight. Millennials ages 25 to 34 appear to have the deepest regrets about their major at 25%, although that figure is only slightly higher than Generation Z and younger Gen Xers. 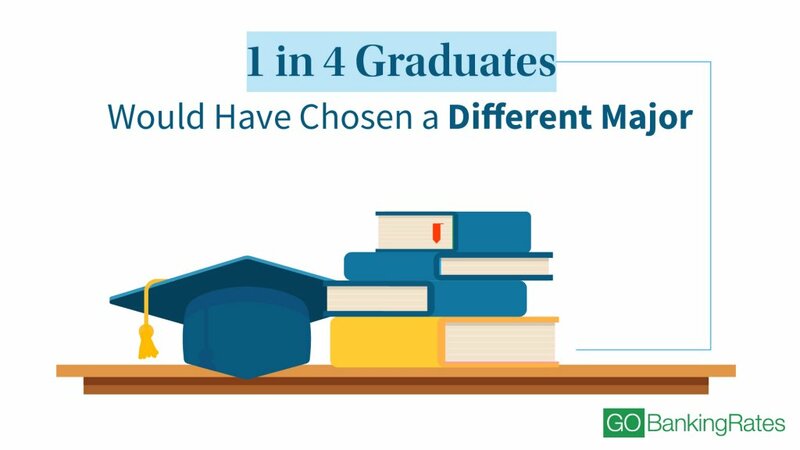 Women are also more likely to wish they had chosen a different major. Only 55.8% answered “none of the above” compared to 63.8% of men, and 28.1% of women said they would choose a different field of study if they could do it all again compared to just 23.2% of men. Few things illustrate the fact that college-educated Americans have very strong, positive views about college overall than a question that focused on the specifics of what people regret. The top answer is the desire to have spent more time hitting the books, followed closely by doing more internships or extracurriculars and then their choice of major. In fact, significantly more people wish they had had more fun during their time attending university than wish they had gone somewhere where tuition costs wouldn’t have necessitated a loan. Younger Americans appear to have a lot more regrets about not enjoying themselves in college. Over a third of those ages 18-24 say that is among their regrets, and it’s nearly 30% for those ages 25 to 34. Compare that to just 6.6% of those ages 65 or older, 5.4% of those ages 55 to 64 and 6.6% of those ages 45 to 54. Attending a large university is not a significant regret for any age group except for those ages 18 to 24, where 18.8% wish they hadn’t gone with a big college. The next highest age group was 35 to 44 at just 6.6%, and the survey as a whole chose that answer at a rate of about one in 20. While similar portions of men and women have regrets about not studying harder, women are much more likely to say they wish they had studied something different or done more internships/extracurriculars. About one in five women selected each of those options, compared to just 15.6% of men saying they wish they had picked a different major and just 13.8% saying they wish they had done more outside of classes. Of course, even those people who don’t have significant regrets about college might still be making some hard choices based on their decision to attend. Asking a question about what people are giving up to pay for college yields some interesting results. 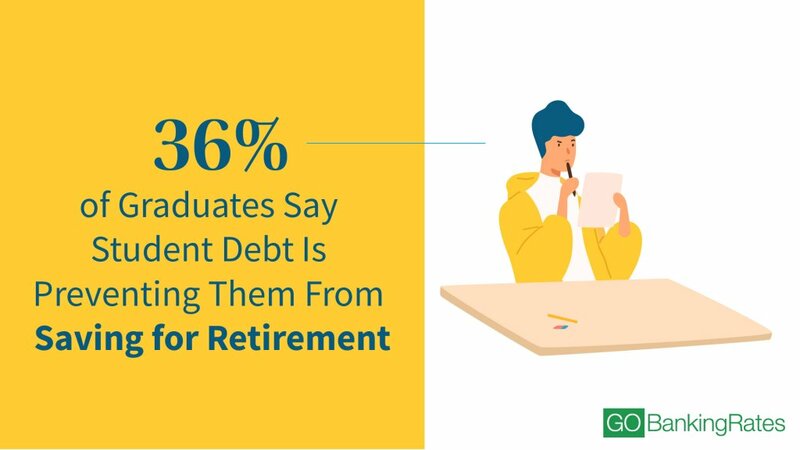 Over a third of the Americans in this survey felt that they were delaying saving for retirement because of their student loan debt, demonstrating how student loans can have a serious effect on other areas of your financial life. Do you think your student debt has prevented you from doing any of the following? Select all that apply. More than one in four respondents feel that their student debt is preventing them from achieving financial independence. But before you assume that’s a lot of millennials who are still living at home, that proportion remains relatively consistent across most age groups. The largest response rate came from those ages 35 to 44 at 34.7% of those polled, and even the 55 to 64 group chose that option at a rate of 27.5%. Only seniors selected the option at a rate lower than 20% at 7.7%. Women are significantly more likely to feel like they have to compromise on their career because of their debt: A little over one in five chose that response, almost double the rate among men. Men, however, are almost twice as likely to say that their student debt has prevented them from starting their own company than women, with 17.8% of men selecting that option to just 9.6% of women. It’s important to remember that, while the debts incurred by attending college can seem vast, for many people they’re actually a smart investment in a better career. With greater earning power and relatively flexible repayment terms for federal student loans, plenty of people can tackle both saving for retirement as well as paying off student loans. The important thing to remember is that the faster you pay down your debt, the sooner you’ll have space in your budget to commit more to saving and the sooner you’ll rid yourself of accumulating interest costs. So, carefully building a budget that carves out a large space for paying down student loans is the best first step. That said, you also don’t want to necessarily pass up the various advantages to retirement saving. If your employer offers a 401(k) with matching contributions, the value of your savings is multiplied and it’s well worth prioritizing over paying down student loans. Likewise, your contributions to an IRA or Roth IRA are capped at $6,000 a year (as of 2019) for most of your career, so devoting some portion of your income to individual retirement accounts is likely worthwhile even if it means delaying the day when you’re finally debt-free by a few years. Click through to read about 30 ways you can dig yourself out of debt. Methodology: GOBankingRates conducted a survey using Survata and asked 500 Americans from across the country the following questions: (1) What is the highest level of education you have attained? [Screening question]; (2) Do you have any minor or major regrets about your undergraduate experience? (3) On a scale of 1 to 5, how much do you regret your ultimate decision to go to college? (1 = no regrets, 5 = greatly regret); (4 and 5) Do any of the following regrets apply to you? Select all that apply. (6) If you could go back in time, would you make any of the following decisions? Select all that apply. (7) How much student loan debt did you accumulate throughout your undergraduate college career? (8) Do you think you would have been able to get your current job without your bachelor’s degree? (9) Do you think your student debt has prevented you from doing any of the following? Select all that apply. (10) Do you believe your college degree is worth the amount of debt you accrued? (11) Would you ever consider furthering your college education? (e.g., getting a master’s or Ph.D.); (12) On a scale of 1-5, how valuable do you feel your college degree is for your career goals? (1= very not valuable, 5 = very valuable); (13) If or when you have children, do you want them to receive their bachelor’s degree? (14) What was your major or field of study in college? (15) What type of college did you attend? (16) By what age do you think you will fully pay off your student loan debt? Survey was run between March 25 and April 8, 2019. Public college tuition is now 3,009% higher than it was in 1969.